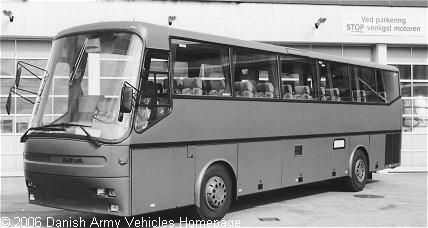 Danish Army Specific: In 1999 a need for new buses arose at the Danish Forces in Kosovo. 2 second hand buses were acquired from a civilian operator, and were delivered through Stiholt Nord in Hjoerring. Historical: VDL Bova, better known as Bova, is a Dutch luxury coachbuilder which began building coaches in 1931. In particular, it is well known for the Bova Futura, a streamlined body, often based on a DAF chassis, which was first introduced in the 1980s and continues in a similar form today. The company was purchased by the VDL Groep in 2003. Height: 3.52 m (137 inches). Engine: DAF, type DKX-1160, 6-cylinder 11.630 cm3 (709 cubic inches) displacement, inter cooler, liquid cooled. Horsepower: 350 at 2.200 rpm. Transmission: 6-speed, ZF type S6-90. Fuel capacity: 800 liter (176 gallons). Range: 3.000 km (1875 miles). Additional: The buses dates back from summer 1990.